Now you never need to worry about a broken heel or torn sole of your favorite shoes again. If your shoes start to fall apart, you can just print a new pair. 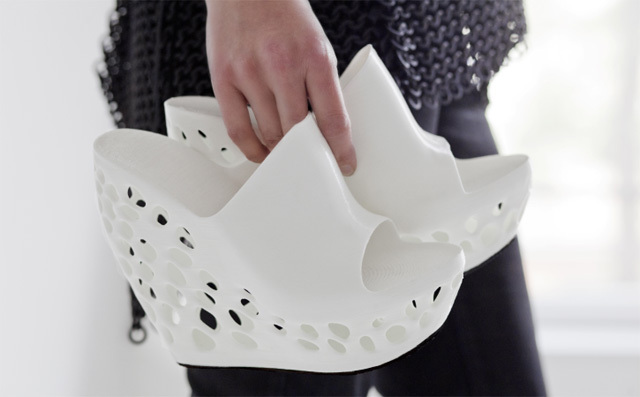 Finnish designer Janne Kyttanen debuted a collection of wedge heels created entirely using a 3D printer. The collection has four designs — Leaf, Macedonia, Facet and Classic. The blueprints for all four pairs are available online on Kyttanenn's Cubify profile for free from there you can get the file of your favorite color. The files are available in various sizes in order to work best for you. If you don't have access to a 3D printer, you can pay Cubify to do it for you. Watch the video above for details, then let us know in the comments whether you'd opt for 3D-printed shoes over the in-store experience.